I know that the last day of each season occurs quarterly, typically on the 21st of a month, but my brain generates its own days for the last day of summer, last day of fall and last day of winter. There are three more weeks until fall ends, but typically this is the time where the weather makes a huge turn for significantly colder temperatures and my brain decides winter has descended upon us. Does your brain do things like that too? 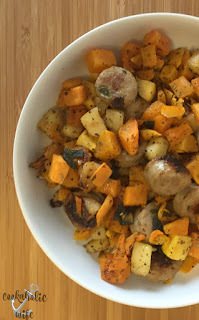 This recipe is perfect for fall which is why I rushed to share it with you before the end of this month. 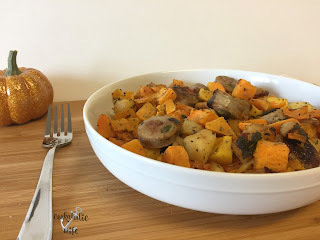 Of course, you could easily eat it throughout the winter seeing as all of the ingredients are readily available, but something about squash and apples together, especially combined with sage is just a October and November dish to me. I threw these ingredients together when trying to come up with something to eat for lunch during the week. Trying to name it was also difficult since it’s just a combination of ingredients tossed together, which I guess is best described as a hash. Full of fall flavors, this hash includes butternut squash, sausage, apples, onions and sage. 1. Preheat the oven to 425 degrees. Spread out butternut squash on the sheet and drizzle with 1 ½ tablespoons of olive oil. 2. Roast for 25 minutes, turning over once halfway through or until fork tender. 3. Meanwhile, melt butter in a skillet over medium heat. Add sage leaves and cook for 1-2 minutes or until just browned. Transfer from the skillet to a large bowl. 4. Slice the chicken sausage into rounds. 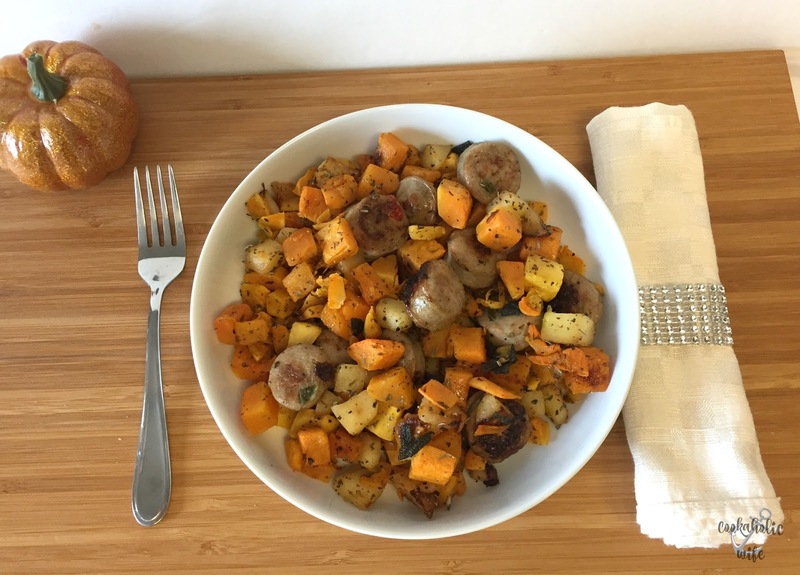 Add ½ tablespoon of olive oil to the skillet and cook the sausage until browned on both sides, 2-3 minutes. Transfer from the skillet to the bowl. 5. Add the remaining olive oil to the skillet. Add apples and onion and cook for 5-7 minutes or until softened. 6. Transfer to the large bowl. Toss in roasted squash and season to taste with salt and pepper. 7. Divide between 4 bowls and serve immediately. To make this recipe easier, pick up the already peeled and diced butternut squash from the grocery store. The chicken sausage I used was the Al Fresco brand in Sweet Italian. You could also use their apple chicken sausage to really play up the apple flavor in this dish. This was so good! I fried the sage leaves in butter first to give them a different flavor which would then carry through the rest of the dish as it was cooked in the same skillet. It brings out a nuttiness to the sage that usually isn’t as pronounced.